Comment: “The Holocaust Educational Trust (HET) is a British charity, based in London, whose aim is to “educate young people of every background about the Holocaust and the important lessons to be learned for today.” It was founded by Greville Janner and Merlyn Rees and in Scotland. In his meeting with Shimon Peres on Wednesday, Lord Greville Janner was speaking as founder of the Commonwealth Jewish Council. But for the children he had entertained earlier in an Ashkelon bomb shelter, his standing with the International Brotherhood of Magicians proved far more interesting. 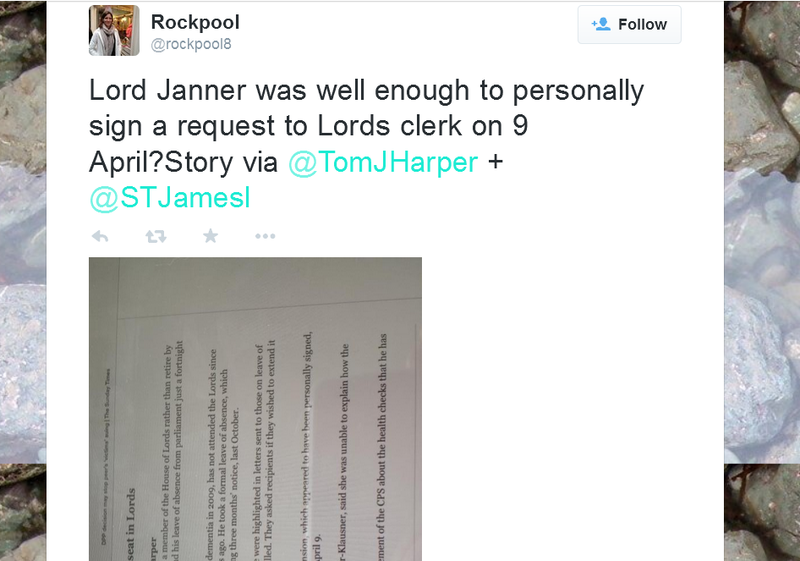 Janner well enough to sign a request to Lord’s clerk 9 April 2015. Strange, but I don’t recall the DPP asking me, as a member of the public, if I thought it would be in my interest to prosecute Greville Janner. In fact, I’m sure I would have shouted PROSECUTE THE BUGGER! had I been asked. Somehow, I don’t feel alone in that. So, how did that decision get made by one DPP who represents ALL our interests in this matter without consulting ANY of us? Perhaps we should all email/write a letter/ text Alison and tell her it most certainly is in OUR interest that she prosecute Janner before he does a Leon Brittan. I’ve just emailed Saunders stating my part of the public interest in this matter. We could also let her know we didn’t give our consent to prosecute in OUR interest: Melanie Shaw; Robert Green(Scotland); Ben Fellows; Julian Assange… nor do we see it in OUR interest to prosecute Sabine, Ella, Abraham, Neelu ….the list is endless. Following on from that, I have emailed a statement informing Alison Saunders of the public interest in prosecuting Judge Pauffley, Detective Constable Rogers and Detective Inspector John Cannon for fraud in the Hampstead case. There’s enough evidence to prosecute, and I KNOW it is in the public interest. Sure, the Director of Public Prosecutions is part of the control system and believes she has the power to refuse to prosecute her friends, but maybe she can only do that if we let her. 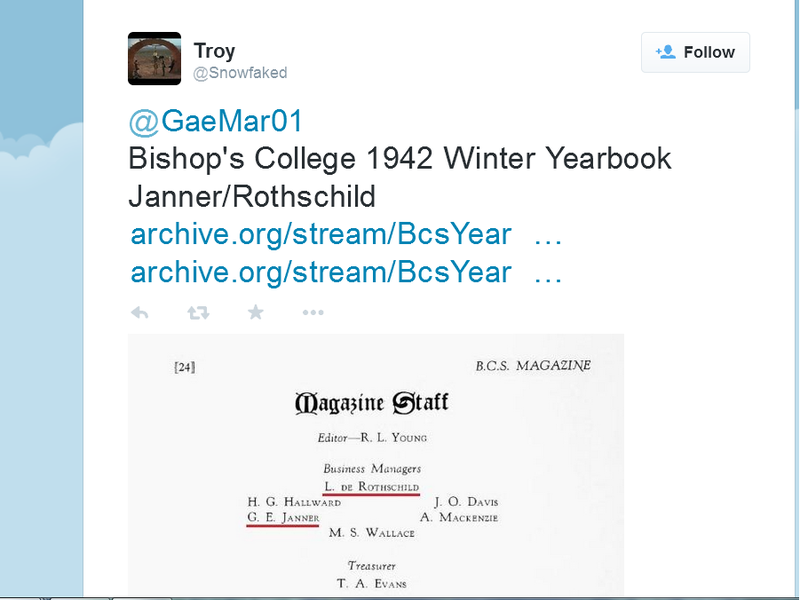 We are the public after all, and it is in OUR interest that these Satanic paedo-sadist killers are stopped, isn’t it? The DPP is just a public servant who is supposed to act in OUR interest. Perhaps every individual member of the public who agrees it’s in the public interest to prosecute these three criminals, ought to email/write and let the DPP know it’s in the public interest? Please feel free to copy, add to, or use parts of the statement below if you like. I was wondering if there might be a way of keeping score of the amount of emails/letters/SMS’s sent to the DPP informing her of our/the public’s interest? …any suggestions? that it most certainly IS IN THE PUBLIC INTEREST to prosecute Greville Janner for these despicable crimes. AND I remind you that it is your duty to listen to the PUBLIC before making any decisions in their interest. Comment: “Robert Bullock, Barrister to Michael Murrin, questions Janner’s ‘dementia’. Why no power of attorney? Can a man with advanced Alzheimers sign away a £2,000,000 property? His flat, in a gated community near Hampstead Heath, north London, was transferred free of charge to his two daughters and son in March 2014 – the same month that police raided his Westminster office, and three months after they had swooped on his home.